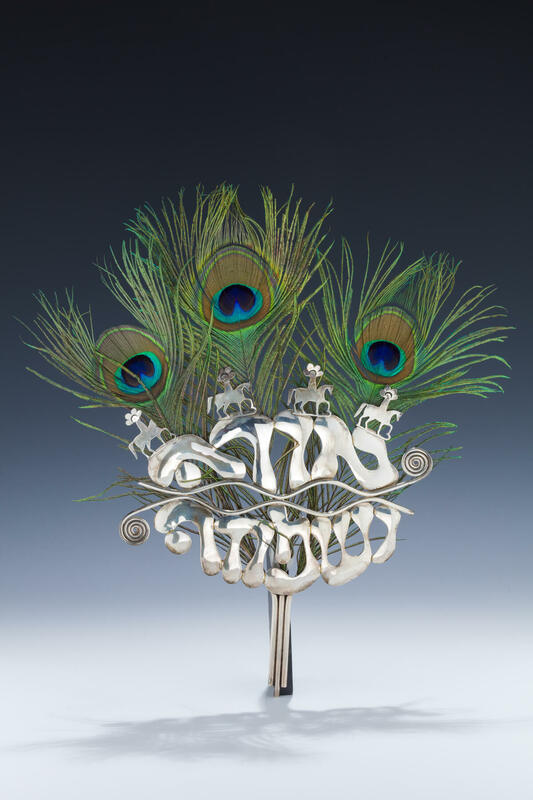 A STERLING SILVER AND PEACOCK FEATHER PURIM MASK. Israel, c. 1980. Hand wrought and cut spelling out “Orah ve Simcha” (Light and Joy). Back comprised of attached peacock feathers. Moshe Zabari was an artist in residence for almost 30 years at the Jewish Museum of NY, and studied under Ludwig Wolpert and David Gumbel at the Bezalel school of Art. Apparently unsigned.17” x 22”.